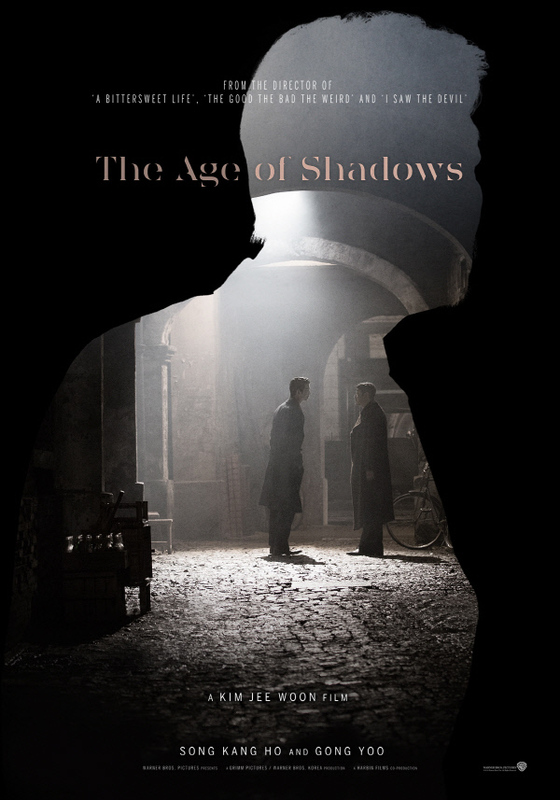 Film Review: "The Age of Shadows" ("밀정") (2016). "Infiltrate and deceive" and "Suspect and disrupt" are key to The Age of Shadows (밀정) (2016). This South Korean action thriller film directed by Kim Jee-woon and written by Lee Ji-min and Park Jong-dae. Set in the late 1920s, the film follows the cat-and-mouse game that unfolds between a group of resistance fighters trying to bring in explosives from Shanghai to destroy key Japanese facilities in Seoul, and Japanese agents trying to stop them. A talented Korean-born Japanese police officer, who was previously in the independence movement himself, is thrown into a dilemma between the demands of his reality and the instinct to support a greater cause. In August 2015, Warner Bros. announced that it would finance and distribute its first ever Korean-language film. With a budget of US$8.62 million would be co-produced by Grimm Pictures, Warner Bros. Korea and Harbin Films. The project was developed under the three companies; the script was developed by Lee Ji-min and Park Jong-dae; Kim Jee-woon (A Tale of Two Sisters (2003), A Bittersweet Life (2005) and I Saw the Devil (2010)), was attached to direct and the cast would consist of Song Kang-ho, Gong Yoo, Han Ji-min, Shingo Tsurumi and Lee Byung-hun. The film was selected as the South Korean entry for the Best Foreign Language Film for the 89th Academy Awards. The film stars Song Kang-ho, Gong Yoo, Han Ji-min, Shingo Tsurumi and Lee Byung-hun. The cast gave terrific performances, though one can not help but notice the poor, thin and "hollywoodized" characterisations that are often associated with big budget historical productions involving a group of resistance fighters fighting against the tyrannical empire. With The Age of Shadows, audiences will be delighted to find the kind of overstuffed historical mega-production that Hollywood doesn't make anymore. Here Hollywood meets Korean cinema with palate-tingling results. It is a fusion that draws shamelessly on its historical epic forebears but remains utterly, bracingly Korean. Here director Kim Jee-woon shows his exceptional direction once again and confidently handles the film's action sequences. The action sequences are a tour de force of action style and Korean ultra-violence that will have genre fans nailed to their seats. It's hard not to admire the film's entertainment and high production value. Guns, explosions and quirky humor have been added to the mix. As vigorously staged as it all is - sometimes confusingly, occasionally with camera-torqueing flair and impressive stuntwork - the urge to thrill grows wearisome at times. Were audience members to be included as a co-conspiritor as well, they'd be in the age of boredom. The story’s many advances and reversals, with the additions of too many characters and the film's tedious running time, can be hard to follow at times. But this isn’t really a movie where plot is paramount. Everything boils down to the action, and what that action means. A confusing and complicated narrative and lacklustre ending detract from an otherwise joyous Eastern historical action flick. In the end, it may not be exactly the rediscovery of form or revelation that Korean cinema has been waiting for or deserves, but it comes close enough. Film Review: "Shin Godzilla" ("シン・ゴジラ") (2016). The film's tagline reads "A god incarnate. A city doomed." Which is what is about to go down in Shin Godzilla. This Japanese kaiju film featuring the titular King of the Monsters, co-directed by Hideaki Anno and Shinji Higuchi and written by Anno. It is the 29th Godzilla film produced by Toho, and Toho's third reboot of the franchise. An unknown accident occurs in Tokyo Bay's Aqua Line, which causes an emergency cabinet to assemble. All of the sudden, a giant creature immediately appears, destroying town after town with its landing reaching the capital. This plunges Japan into chaos. This mysterious giant monster is named "Godzilla". The reimagines Godzilla's origins, where he emerges in modern Japan for the first time. In 1954, a terrifying and formidable creature emerged from the depths of Tokyo Bay, and terrorized movie screens all over the world. The film was Gojira, and it went on to become one of the biggest franchises in movie history that spawned a genre of its own. But ever since Godzilla: Final Wars (2004), the character and franchise laid dormant. Until in December 2014, Toho announced plans for a new domestic Godzilla film for a slated 2016 release, stating "This is very good timing after the success of the American version this year: if not now, then when?" Making this film the first Toho-produced Godzilla film in 12 years. The film's writer and chief director Hideaki Anno was offered the director's chair for the film. He reportedly refused Toho's initial offer in order to work on the fourth Evangelion movie but was convinced to join the project after his longtime friend Shinji Higuchi signed on to direct. In March 2015, Both Anno and Higuchi were announced as the film's directors. Both Anno and Higuchi are longtime friends and collaborators, and are both well-known for their work on the popular anime series Neon Genesis Evangelion (1995). They were selected by Toho to work on this film in part due to their work on the series. Like the original for its nuclear allegory, the film was inspired by the Fukushima Daiichi nuclear disaster and the 2011 Tōhoku earthquake and tsunami. This is the first Japanese Godzilla movie to be a full reboot, meaning that it shows what would happen if Godzilla attacked for the first time in modern day, and there had been no previous records of him. Although Toho has "rebooted" Godzilla a few times each previous film acknowledged the original 1954 movie as canon and just ignored all previous sequels. 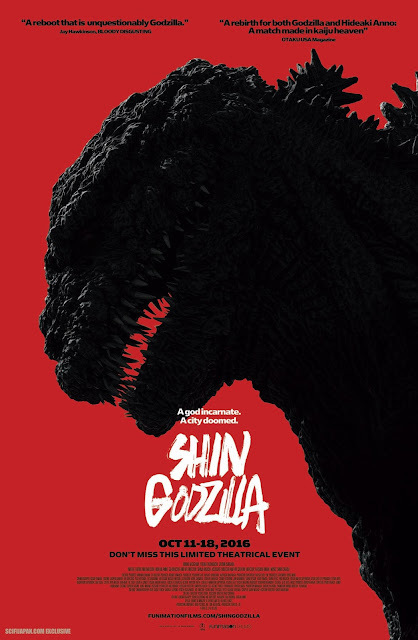 In September 2015, Toho revealed the film's official title as Shin Gojira and that the film will star Hiroki Hasegawa, Yutaka Takenouchi, and Satomi Ishihara. Producer Akihiro Yamauchi stated that the title was chosen for the film due to the variety of meanings the syllable "shin" could convey, such as "new", "true", and "god". Principal photography began in September and concluded in October 2015, with the special effects work following in November that year. According to sources close to the production, Godzilla's design in the film will be mostly based on his design from the original film, and is intended to appear very frightening. This film's Godzilla stands 118.5 m (388 ft) tall, surpassing Legendary Pictures' Godzilla, which stood 355 ft/108 m tall thus making it the largest version of Godzilla to appear on film. Higuchi revealed that Godzilla in this film will be brought to life using a hybrid combination of computer generated imagery and traditional practical tokusatsu effects techniques. Higuchi utilized this same hybrid strategy for the live-action Attack on Titan films. Higuchi, has previous experience working on special effects in multiple kaiju films by Toho. He previously worked as a special effects assistant for Godzilla 1985 (1984) and then was in charge of special effects for Shûsuke Kaneko's Gamera trilogy in the late 1990's. Higuchi also worked on the special effects in one scene for Godzilla, Mothra, and King Ghidorah: Giant Monsters All-Out Attack (2001). Godzilla was portrayed in motion capture by Mansai Nomura, a Kyogen (traditional Japanese comic theatre) actor. To realize Godzilla's slow movements, a 10-kilo weight was strapped behind him, and he incorporated the technique of the traditional Japanese dance into his performance. The film was released in Japan on July 29, 2016 to critical acclaim from Japanese critics and was a box office success, becoming the highest grossing live-action Japanese film for 2016 and the highest grossing Japanese-produced Godzilla film in the franchise. The film features an ensemble that includes Hiroki Hasegawa, Yutaka Takenouchi, Satomi Ishihara, Kengo Kora, Akira Emoto, Jun Kunimura, Mikako Ichikawa, Pierre Taki and Shinya Tsukamoto. All of the 328 actors in this film gave terrific performances of people who ultimately save the day despite being tedious in a few areas due to their bureaucratic nature. Shin Godzilla is a refreshing approach to the franchise and the genre, even when revisiting it a decade later, in an era inundated with Hollywood movies where each tries to better the last's visual effects budget. Both Anno and Higuchi have taken Godzilla back to his roots. They both get the titular monster right. If there is one Godzilla film anyone should see, this is it. It's a kaiju film with a dark, serious political tone that's very well-written with nothing but incredible actors involved. The film is moody and visually stimulating, it sees the King of the Monsters finally giving the treatment and respect he deserves, in what can only be described as one of the greatest re-vamps given to an enduring character. It can be thought of as 'what if either Stanley Kubrick or Christopher Nolan directed a Godzilla film.' It may be a bit adult for younger children, but for everyone else the film is just about the perfect kaiju movie. Drained of its silliness, the franchise rediscovered its valor, landing Godzilla his finest motion picture effort to date. An impressive cinematic renaissance for the franchise, and a blockbuster with more intelligence than most. An utterly amazing and riveting start to a brand new beginning. A blast of energy that reinvents Godzilla for a new generation of film-goers, which the 2014 film failed to accomplish. Take note Gareth Edwards, this is what a Godzilla film should be. And the last shot? Oh, that last shot. "There is a switch, if you throw it, half the people on earth will die. But if you don't, the human race will be extinct in a hundred years. What would you do?" This is the fundamental question looming in Inferno. This mystery thriller film directed by Ron Howard, written by David Koepp, based on the 2013 novel of the same name by Dan Brown. The film is the sequel to The Da Vinci Code (2006) and Angels & Demons (2009), and is the third installment in the Robert Langdon film series. Famous symbologist on a trail of clues tied to the great Dante himself. When Langdon wakes up in an Italian hospital with amnesia, he teams up with Sienna Brooks, a doctor he hopes will help him recover his memories. Together, they race across Europe and against the clock to stop a madman from unleashing a global virus that would wipe out half of the world's population. Following the release of Angels & Demons, Sony moved forward with adapting The Lost Symbol, but the production suffered "development hell" as both Howard and Hanks were hesitant to return to the series. Ultimately, the novel Inferno was released in 2013, and Sony decided to forward with adapting Inferno instead with a set December 18 2015 release date. In late August 2014, Sony had finalized the deal to have Howard, Koepp, and Hanks to direct, write, and reprise his role of the famous symbologist, and set production for a April start date in Italy. By mid February 2015, Sony announced the cast for the film that included Felicity Jones as Dr. Sienna Brooks, Omar Sy as Christoph Bruder, Irrfan Khan as Harry "The Provost" Sims, Sidse Babett Knudsen as Elizabeth Sinskey, head of the World Health Organization, and Ben Foster as an unspecified villain, which later revealed to be the role of Bertrand Zobrist. Filming began in late April, and wrapped in late July, with a budget of $75 million, and under the codename Headache. Locations included Venice and Florence, Italy, and Korda Studios in Budapest, Hungary. In early 2016, the release date for the film was moved to October 28 2016 to avoid clashing with Star Wars: The Force Awakens (2015). The release marks a decade after the release of The Da Vinci Code, and the first film in the series to be released in the Fall instead of Summer. The film stars Hanks, reprising his role, alongside Jones, Sy, Knudsen, Foster, and Khan. The cast gave compelling performances even though it bordered on complete silliness and absurdity. At times, every supporting character acts like an unhelpful idiot to keep the plot stirring, while yet again a seemingly all-powerful conspiracy seems to consist of a few evil people. 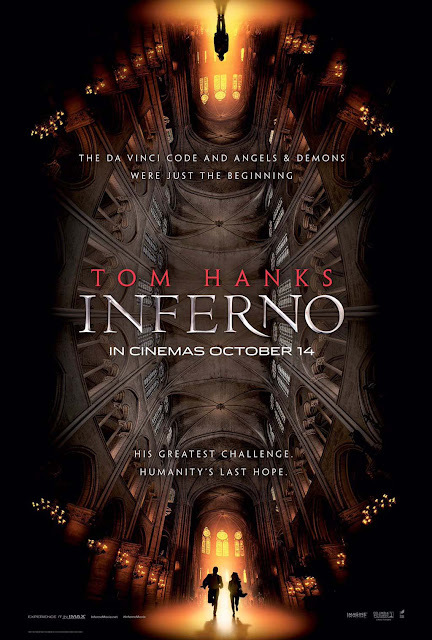 Inferno is a fast-paced thrill ride, and an improvement on the last Dan Brown adaptation, Angels & Demons, but the storyline too often wavers between implausible and ridiculous, and does not translate effectively to the big screen. Also, see my review for The Beatles: Eight Days a Week - The Touring Years. Film Review: "Miss Peregrine's Home For Peculiar Children" (2016). "Stay peculiar", which is what Miss Peregrine's Home For Peculiar Children encourages. This dark fantasy adventure film directed by Tim Burton and written by Jane Goldman, based on the novel of the same name by Ransom Riggs. 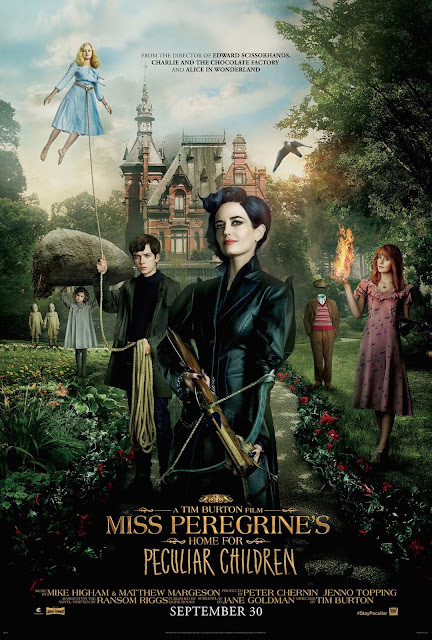 When Jacob discovers clues to a mystery that spans different worlds and times, he finds a magical place known as Miss Peregrine's Home for Peculiar Children. But the mystery and danger deepen as he gets to know the residents and learns about their special powers... and their powerful enemies. Ultimately, Jacob discovers that only his own special "peculiarity" can save his new friends. In May 2011, the film rights to the 2011 novel were sold to 20th Century Fox. Chernin Entertainment also signed on to produce the film. In November, Deadline.com reported that Tim Burton was in talks to direct the film. In December, Jane Goldman was reportedly hired to adapt the story as a screenplay for the film, while Burton was not confirmed yet. In July 2014, Eva Green was set to play the title role. In September 2014, it was announced that Asa Butterfield was being eyed for the lead role. In November 2014, Ella Purnell was in final talks to join the film. In February 2015, Samuel L. Jackson was added to the cast to play Barron, a character made for the film. By March 2015, Terence Stamp, Chris O'Dowd, Rupert Everett, Kim Dickens, and Judi Dench were announced as being in the cast. Filming was initially set to begin in August 2014 in London. In February 2015, Principal photography began in the Tampa Bay Area. Tampa Bay Times revealed that some parts of the film were being shot in London. Filming lasted for two weeks in Hillsborough and Pinellas counties, in the Florida area. It is the second Tim Burton film to be shot in the Tampa Bay area, the first being Edward Scissorhands in 1989. Production of the film later moved to Cornwalland, Blackpool in the UK, and Brasschaat, a municipality close to Antwerpen (Antwerp), Belgium. The movie was originally scheduled to be released on March 4 2016, but it was changed to Christmas 2016, then changed once again to September 30 2016. The film stars Eva Green, Asa Butterfield, Chris O'Dowd, Allison Janney, Rupert Everett, Terence Stamp, Ella Purnell, Judi Dench and Samuel L. Jackson. The cast gave peculiar performances, and maybe Burton's best cast in years. Kudos goes to Green, O'Dowd, Janney, Everett, Stamp, Dench and Jackson who gave solid performances. Butterfield, Purnell and the other children gave unique performances, even though, at times, had dry moments. Darker to most family movie fair, Miss Peregrine's Home For Peculiar Children is for people who like their family fair visually appealing and dark. The film is a clever, smart fantasy that targets the outsider inside every one of us. It's Burton's richly entertaining adaptation is one of his best films in years. A film that is just as comic, beautiful and haunting as its source material. Also, see my review for Big Eyes.